I’ve heard tell that desperate times call for desperate measures. My husband Ted and I hit one such first-world measure en route to our honeymoon destination, Paris. On the car ride from our condo to the airport, it struck us that we’d forgotten one very important item: a camera. I mean, seriously, who — prior to the days of iPhones and Instagram — packs for anywhere in Europe and forgets a good, old-fashioned camera? No big deal, we decided. We’d make a quick stop and buy one. So there we were, at a Kmart less than a mile away from the airport at five-thirty in the morning, frantically determining our photographic future. Not only did we choose a store that didn’t have a wide selection of good cameras, this was before the ease of looking up reviews on that handy-dandy smartphone. We wouldn’t discover until over 7,000 miles later that we might as well have taped the word “loser” to our foreheads. Sure, we had pictures of us at the Eiffel Tower. We had carefully constructed shots of the district of Île de la Cité taken from the bell tower of Notre Dame. There we were at the Louvre and Musée d’Orsay. And who could forget the Sacré-Coeur Basilica and the artists’ square of Place du Tertre? Well, all those memories were captured on that 110 film. Yep, we chose the starter camera that parents used to get their kids for their eighth birthdays over 35 mm. Cheap film. Cheap camera. Our printed pictures — a collection of grainy and often out-of-focus shots — revealed this not-so-pleasant surprise. The whole “Paris Honeymoon Camera Fiasco,” as I’ll call it, could have created an ongoing point of contention for Ted and me if we’d let it. Instead, we chose — from the beginning — to embrace the humor in it. In our marriage, a sense of levity — or lightheartedness has carried us through a myriad of seasons. Ted and I have navigated the joy of our four daughters’ births, as well as the pain of job loss, the stress of cross-country moves, and a miscarriage. And while we’ve certainly cried tears of frustration and grief along the way, we’ve also tried to consistently find the humor in life. For us, laughter has been “good medicine” (Proverbs 17:22). In fact, if there’s one thing we know how to do — and do well — it’s laugh together. While I’m no expert on why certain couples have trouble laughing together, what I do know is why Ted and I do not have trouble. You see, when it all comes down to it, an unburdened heart is a lighthearted heart. And when you put two unburdened hearts together, laughter may very well follow. When I say “unburdened heart,” what exactly do I mean? Simply, an unburdened heart is one that’s not weighed down by grudges. In our marriage, Ted and I have come to see that unburdened hearts can’t coexist with records of wrongs. It’s difficult to feel lighthearted and at ease in our relationship if we’re keeping tallies on each other. Does that mean letting things go always comes naturally for us? Are we able to just snap our fingers and forget? Of course not. Sure, the more we practice it, the easier it gets. But, as our pastor shared in a sermon series, our inclination when wronged or offended is retaliation, not restoration. On our own, we’re more like the fowl in Angry Birds than we are like Jesus. If I consistently went with that immediate reaction of retaliation, I wouldn’t overlook offenses. The thing is, the more Ted and I choose not to be offended or harbor unforgiveness, the more freedom we feel. Freedom for ourselves. Freedom for the other. Freedom in our marriage. When we both know that the other isn’t set on holding any grudges, we’re able to be ourselves. We’re able to admit our weaknesses or immature reactions and laugh about them together. Maybe one day Ted and I will make it back to the City of Light. With this trip, though, I expect we’ll say “Bonjour!” a bit more prepared. Not only will we have our DSLR and three special lenses in tow, but we’ll pack our iPhone 12 for good measure. Not to mention, we’ll also be sure to bring along the levity that’s served our marriage well. I’d hate to have any grudges distract from late-night dinners in the Latin Quarter, walks along the Seine, or introspective wanderings through the catacombs. For more practical ways to cultivate and strengthen unity in your marriage, check out Ashleigh’s new book, Team Us: Marriage Together. 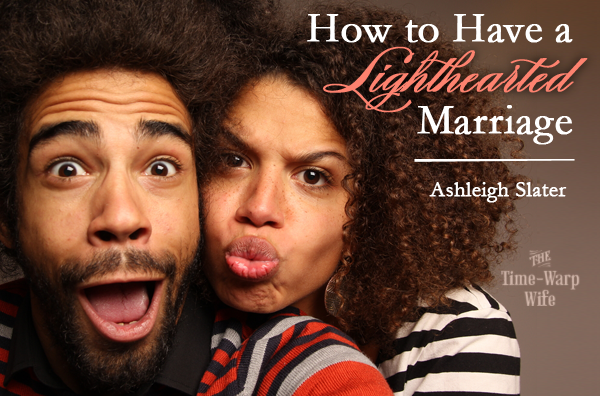 In it, Ashleigh shares from her own marriage as she presents couples with realistic ideas on how to foster cooperation, deepen commitment, and exercise grace on a daily basis. This post has been excerpted from Team Us by Ashleigh Slater. Used with permission from Moody Publishers © 2014. « Titus 2sDay Link-Up Party! Someday Paris again…armed with your cameras! Love this idea of laughing through the inconveniences of life. This is such a great reminder that laughter can bring so much joy, not only to a marriage, but to our children who benefit from seeing their parents laugh together. Thank you! Humor is one of the best things we have in our marriage! We’ve only been married one month and two days but already we’ve been over some hurdles and humor has served us well. We choose to address the negative but to also find positive in pretty much everything and from there we can find laughter. It’s a tremendous gift from God, is it not? Thanks for the great post. Ashleigh, thank you so much for sharing. My husband and I just renewed our wedding vows after 25 years of marriage. About half way through that, God began to open my eyes to the fact that I was indeed keeping a record of wrongs. It almost destroyed my marriage. But I am very thankful that God showed me what the problem was. Now, we are more in love than ever. Joy and laughter are a huge part of that. You can’t enjoy your spouse if you harbor unforgiveness. Thanks again Ashleigh! Wonderful article!! Let nothing steal our joy!….my mom still uses the camera that you wind up before each shot…after each pic my daughter “grandma let me see” !! Instant laughs. Thanks for sharing. It’s a shame that not all burdensome events in a marriage are laughable. An unfaithful spouse or an abusive situation is another ball game. That’s where rebuilding and forgiveness take over.